What is your favorite classical commentary? What place did it have in your intellectual development? Recently I asked the members of the DCC editorial board to write for the blog about these questions. Here is the response of Ariana Traill, Associate Professor of Classics at the University of Illinois Urbana-Champaign. He considered Latin, Greek and English literature and language far more important for a student than mathematics or the physical sciences and felt that Union was straying from the path of true education when it began offering programs in what Ashmore termed “pseudo-practical” fields such as electrical engineering. His passionate nature also occasionally made “Ashy,” as students nicknamed him, a target of student pranks. In October of 1883, again according the researchers of the Shaffer Library, a group of sophomores got an organ grinder to play outside his classroom. Ashmore paid him to go away, but when the organ grinder was found playing at the back window, Professor Ashmore jumped out the window to chase him away, famously putting on his hat prior to doing so. Whatever his failings as an appreciator of music, his Terence commentary is still very valuable, and I have retained a fondness for it first gained during my own days as an undergraduate student. It is an old-fashioned commentary in the nineteenth century style (you can find all of Suetonius’ Life of Terence in the introduction – in untranslated Latin), published by Oxford in 1908. What I liked about it as a student was Ashmore’s unerring sense of the stumbling blocks for novice readers. He supplies the missing words, without wasting any space about it (Eun. 666, “miserae: sc. mihi”), and will helpfully tell you when an ellipsis “was hardly felt” (as at Ad. 326, quis ergo: sc. fecit). He always names the construction (especially when it isn’t what you might think it should be, like facis at And. 322, “the pres. is more vivid than the fut.”) and he anticipates issues that stump first time readers (Who is subject of inquit at Eun. 581? Oh yes, Thais. The dum at Phorm. 512? “Purely temporal; ‘while’.”) Ashmore doesn’t miss much: it’s a rare line that does not have its own entry in the comments. You can count on him for admirably brief, but informative, definitions of unfamiliar vocabulary: frugalior (HT 681) “comparative of frugi; ‘more exemplary’”; depexum (HT 951) “combed down,” “curried,” hence “flogged.” The notes are sometimes amusing (e.g., perduint, “the form was archaic even in Terence’s time, and confined mostly to this curse”, HT 811). And Ashmore did more than explain grammar and translation questions: he provided reminders of what one character knows that another doesn’t; he pointed out staging (HT 731, for instance, was “said in a loud voice, that Clinia and Syrus may hear”), explained characters’ motivation and noted ironies. Even more useful, he presented the information needed to follow the plot on a scene-by-scene basis. There were no long plot summaries to read (and forget) at the beginning of the play: just three to four sentences every few pages, throughout the commentary, where they helped most. Yes, you had to flip back to cross-references to find the first time a question was answered; you had to know Greek to get the point of the untranslated phrases that appeared regularly throughout the comments; and, despite the introduction and occasional notes, there was not enough help to elucidate the far-from-simple scansion of Terence’s iambo-trochaics. But there was never a lot of reading to get the essential information from Ashmore’s elegant, concise, and lucid comments, and it was never a waste of time to read his note on a line. 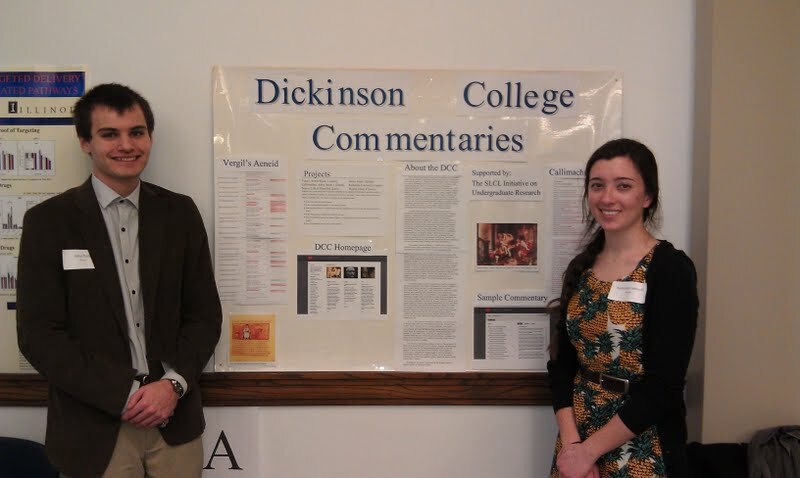 He did what the Bryn Mawr Commentaries, and now the DCC, do: he helped students understand the Latin with a minimum of explanation. What I came to appreciate later, as a scholar and teacher, is that Ashmore wrote with a view to teaching reading comprehension, not just translation. He glosses in the target language (HT 723 Syri promissa induxerant = Syrus promissis induxit). He explains much that is implicit, what we might call the cultural competence of a native speaker. For example, a note on cistellam, at Eun. 753, explains birth-tokens, infant exposure, and the implication here that “Pamphila had been kidnapped.” His comment on ridiculum at Ph. 901 explains what Demipho is not saying but clearly means, namely “that it’s absurd to ask such a question, as if their purpose in coming to him were not self-evident. Phormio must return the money, which (in their view) he is no longer entitled to keep.” Ashmore understood that there is much more to following a Latin conversation than simply glossing the grammar and the vocabulary. He translated frequently, but always with a view to elucidating the Latin, often juxtaposing a literal translation with a freer one. Eatur (HT 743) is a good example: “let a start be made (then),” “let us go.” After years of teaching myself, I recognize the scene summaries as a well-tested pre-reading strategy to promote comprehension of passages that are being read for the first time. Ashmore also integrated his scholarship so deftly that, to be perfect honest, I ignored it almost entirely as a sophomore reading Terence for the first time. I came to recognize later that this text and commentary was a substantial work of scholarship. Of course, recent and fuller commentaries on individual plays have superseded Ashmore, notably R.H. Martin’s Adelphoe, John Barsby’s Eunuchus and A.S. Gratwick’s Brothers. Yet Ashmore’s remains a model of a commentary with a keen awareness of what students actually need.